Florent Schmitt was born in Blamont (Meurthe-et-Moselle), France. His longevity meant that he was still alive when his Second Symphony was premiered by Munch in 1958. 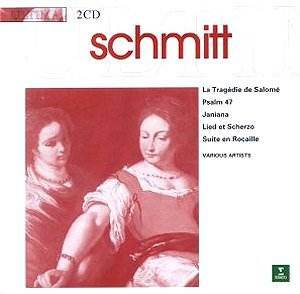 The first of the two CDs contains the works (Salomé and Psalm) by which he is likely to be best known - if at all. They were splendidly recorded by EMI-Pathé-Marconi in the early 1970s using ORTF forces conducted by Martinon. I still have that luxurious sturdy gatefold LP as well as the more pinched CD incarnation. The Tragédie is based not on Wilde but on a poem by Robert d'Humières and is dedicated to Stravinsky then (1907) still a �wild boy� both fêted and flogged by the Parisian cultural establishment. There are reflections, as well as predictive touches, of Dukas (La Péri), Wagner, Bax (Spring Fire, Fand and the Second Symphony), Respighi (Vetrate di Chiesa), Holst (in The Planets - try tr2 2.47) and Debussy (La Mer). The reduced orchestra version was given in Paris on 9 November 1907 six months after Strauss's Salome had been aired there. The large orchestra version, given here, is heady, mood-rich, warmly dreamy. The distant vocalisation of the choir at tr2 7.29 is very well handled - lovingly distanced. The oriental Muezzin curving of the singing prompts thoughts of Delius's Hassan and the Delius Requiem and also put me in mind of two much later hyper-romantic works - Harty's Children of Lir and Enescu's Vox Maris. Janowski does not have quite the abandon incited by Jean Martinon but this is still a well conceived and enthusiastic performance. Schmitt pulls out all the stops for the single movement Psalm. This shouts in colossal exultation with impassioned oaken tones from the massed French radio choirs blazingly done and with a nod towards the towering tones of Berlioz's choral monuments. It sounds big - none of the chamber choir approach. While it is weakened to a degree by a proneness to rum-ti-tum rhythms in the outer sections, recalling his friend Vaughan Williams, it is also decidedly Rimskian and leans on the example of Borodin and the Polovtsian Dances. Although in one movement, it is a triptych (likened in the excellent notes to Franck's Prélude, Chorale et Fugue) with the Glory to the Lord and God has ascended framing He has chosen the beauty of Jacob. The solo violinists are Prat in Salomé and Commentale in the Psalm. Commentale is given more to do and his touchingly febrile role in the central panel is nicely balanced up with his co-singer, the toweringly dramatic and operatic-toned Sharon Sweet. I can easily hear her tackling Herrmann's jeu d'esprit pastiche aria from Salammbo in Citizen Kane. The two soloists would pair just as well in Frank Martin's Maria Triptychon. Such a pity that while Erato have printed the words in English translation the French is missing. In Janiana the music melts suavely through the nostalgic, the regretful and courtly panache - always tonal and always engaging. There are several times when the music seems to be a likely jumping off point for Bernard Herrmann's tragically romantic and elusive moods. The dynamism of the writing, helped along by slightly acidic sound from the mid-1960s, is reserved for the last of the four movements. This is very affecting music. And if you are wondering about the title, this derives from the first name of the dedicatee, Jane Evrard. Its luxuriance is in the themes and emotions but not in the harmony and counterpoint. The note-writer proposes some linkage with Psalm 47. However the work is more lithe and its exultation is sharper and more cleanly limned. It was written, during the Occupation, in the Pyrenees during the spring of 1942. The archaic-impressionism of the Suite is romantic and subtly balanced. In a hundred details I would count this superior to the recent Praga Digital version though the Czech musicians are better recorded. Jamet and her players have a soft and secure hold on the butterfly wings of this gem-like queue of miniatures. It was written for the Pierre Jamet quartet and is in the tradition of the Ravel Introduction and Allegro and the Bax Harp Quintet, Nonet and Elegiac Trio. In the vif Ravel's emotionally piercing emphasis is entwined with a country dance that sounds positively Viennese - not Schmitt's first dalliance with Germanic culture - witness his Caprice Viennoise recorded on a Timpani collection of rare recordings by Wolff and the Lamoureux. The 10 minute long Lied et Scherzo is dedicated to Dukas and is startling in its dissonance; not that it is extreme for a work written in 1910. Del Vescovo and Hubeau seem fully at ease with the idiom and handle the sincere and coaxing song with engaging address. The Gallic tone of the horn verges on the tubby but when, as in 3.48, Vescovo sings his long tune the mood is superbly sustained. The intractable balance between the two instruments is well done. The Scherzo is by no means as good a piece of music as the Lied. Despite the DDD emblazoned the box this will not apply to the recordings on the second CD which date from the 1960s. These must be ADD while CD1 (Psalm and Salomé) is almost certainly a true DDD item. This is an inexpensive set though one you do not often see in the shops. . The anonymous notes are specially written and though not lengthy tell you all you need to know. As with the other Ultimas the design is clean and admirable. Pity Warners could not find more Schmitt to flesh out the playing time. They clearly had plundered Erato's tape archive pretty much to the back of the shelf. Do not hesitate if you are at all interested in this composer or his era. It is not unusual to see these Ultima sets on offer with three at a very discounted price.